A Spacious Detached Two Bedroom Coach House situated just outside of Buckingham town centre on the popular Lace Hill development. The property benefits from gas to radiator central heating, uPVC double glazing, a good size lounge/diner, integrated kitchen appliances, two double bedrooms, a larger than average garage with a large storage cupboard with light and power, additional parking in front of the garage and a separate garden. 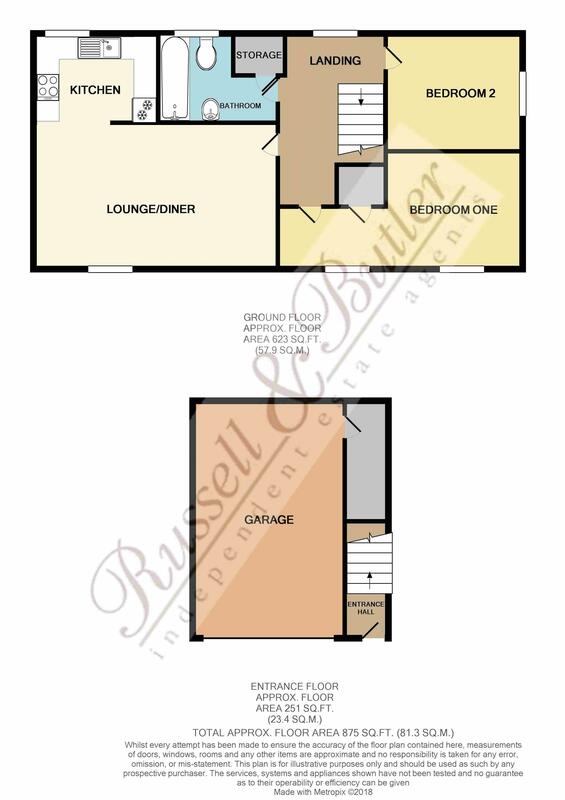 The accommodation comprises: Large open plan lounge/diner opening through to the kitchen, there are two double bedrooms with the master bedroom having a dressing area and storage cupboard and a family bathroom. The property would make a great first time buy or investment purchase, viewing is highly recommended. EPC Rating B.
Radiator, stairs rising to first floor. A range of base and eye level units, stainless steel sink unit with mono block mixer tap with cupboard under, work tops over, integrated oven and hob, extractor over, integrated fridge freezer, integrated washing machine, cupboard housing gas fired boiler, downlighters, uPVC double glazed window to rear aspect. Two uPVC double glazed windows to front aspect, radiator, dressing area and storage cupboard. uPVC double glazed window to side aspect overlooking the garden, radiator, access to loft space. White bathroom suite comprising of a bath with shower over and screen, sink with mixer tap, low level wc, tiling to splash areas, radiator, uPVC double glazed window to rear aspect, downlighters, storage cupboard. Parking in front of garage, gated access to a private, fully enclosed garden. Fully enclosed, laid mainly to lawn with paved area. Larger than average garage with an up and over door, power and light connected, separate storage lockable cupboard and an outside tap. All main services connected. Council Tax Band B. Approx. 8 years remaining on the NHBC Warranty. Some Restricted Head Room. Leasehold. Lease of Length TBC. Ground Rent £250 per annum. Service Charge approx. £150 per annum.